A bunch of goodies are 10% off for the next 48 hours! Get great deals on annual catalog stamps & kits! Start shopping! 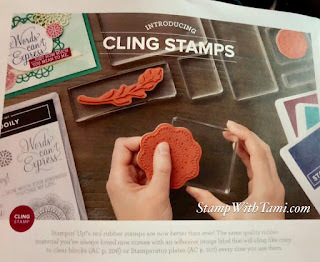 Red rubber stamp sets (clear-mount or wood-mount) in the annual catalog that will be carrying over will transition to cling with the 2019-2020 annual catalog. Watch for more information about carryover stamp sets in April 2019 with the regularly scheduled communication about catalog transitions, the carryover list, and the retiring products list. *Wood-mount stamp set sales have been steadily declining for several years. Stampin’ Up! research and sales teams took this and several other factors into consideration before discontinuing wood-mount stamps. We are confident the transition to cling stamps will be beneficial in many ways for demonstrators, customers, and the company. 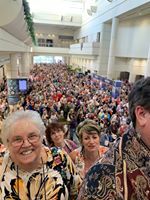 My friends Terry and Norma heading to the lunch room with a few thousand of their stamping friends! Big news just announced from Stampin’ Up OnStage....cling mount rubber stamps are coming!!! And they are super sticky, no more worries about them not sticking to the acrylic blocks. Stay tuned for more details and more news.